What is the current state of CSO involvement in EU-funded research? Our survey of projects funded through the European Commission's Seventh Framework Programme (FP7) demonstrated that 27% of the total number of Project Coordinators, mainly researchers, reported collaborating with at least one CSO (n=2856). The main reported roles of CSOs within such projects are to provide expert knowledge (69%), be a member of the research team (51%), contribute to the discussion and evaluation of results (46%) or contribute to publications (47%). A further follow-up survey focused on those projects from the initial survey which reported CSO involvement (455 projects). 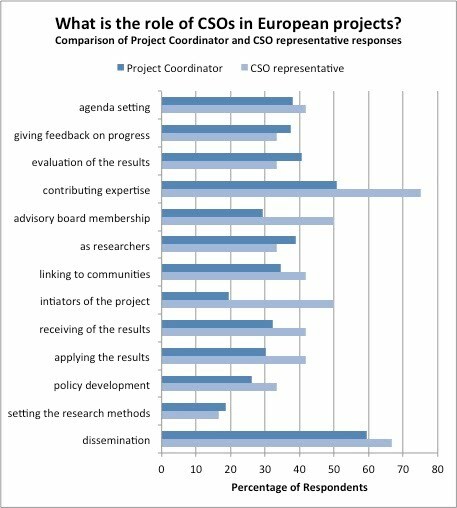 Both Project Coordinators and CSO representatives were invited to complete this second survey; their views on the roles of CSOs in European projects are summarised in the figure below (n=162). These data clearly show that CSOs are perceived as being fundamental for contributing their specialist expertise and disseminating the project results. There are however some discrepancies, for example according CSO representatives they play a role of initiating projects more often that many Project Coordinators acknowledge (50% / 19% of responses respectively). CSOs also claim a greater role in contributing specialist expertise and membership of advisory boards than Project Coordinators perceive. Such evidence suggests that project coordinators perceive a more passive role for CSO members which differs from how CSOs see their own involvement. Further findings suggest that there are various different types of CSO involvement: there is a clear difference between the most minimalist and the most inclusive participation processes. On the one hand there are minimalist projects that do not give the CSOs equal status to the researchers, lack recognition of their role, sometimes exclude their membership from the consortium, do not support a strategic partnership, provide a marginal role inside the research team or provide a merely tokenistic membership. On the other hand, in the most inclusive projects researchers and CSO members share an equal status, achieve mutual recognition and responsibility, and all play an active role inside the consortium.